While Betsafe itself has been around for more than a decade, having officially launched in January 2006, since 2011 it has been owned by the Swedish company Betsson, which has its own gambling heritage stretching back to 1963. You could therefore barely choose a more trusted sports betting brand – but is the Betsafe site still a decent bet, or just a gamble? There’s an impressive assortment of periodically updated promotions on offer at Betsafe across its sportsbook, casino and poker sections alike. Betsafe therefore makes particular sense if you intend to use all parts of the site regularly, rather than merely have a flutter or two on sport. However, even users in the latter category should be more than satisfied with the intriguing offers and boosts that the site provides. Betsafe has had plenty of time to assemble a winning selection of sports betting markets, and sure enough, that’s exactly what it offers. In-play betting is a prominent part of the experience at Betsafe, and as the term implies, this section of the site is all about having a flutter on the outcome of a fixture as the action is taking place. You can also launch a separate ‘Livescore’ window that gives you a nice overview of the latest scores in such popular sports as tennis, ice hockey and football. Like most leading online betting sites these days, Betsafe also has a well-developed mobile presence. You can access Betsafe directly through your smartphone’s Internet browser, and it’s such a sweet-looking and slick-to-use version of the site that you might even prefer it to the desktop experience. A dedicated mobile app can also be downloaded if you would prefer to avoid the intrusiveness of a browser window. With the likes of pre-match and in-play betting, casino games, poker and so much more available through this app, it may just become the one solution you ever need for all of your online gambling. As we touched on above, the Betsafe site is a good-looking one on a smartphone, and the desktop site’s decent in this regard as well. Admittedly, everything’s a bit black and grey with elements of dark red, but it’s all perfectly gentle on the eyes, and the navigational systems both along the top and down the side of the site are quick and easy to use. One aspect of the site that particularly caught our eye was the Virtual Sports section. If you aren’t familiar with virtual sports betting, it’s basically akin to betting on the outcome of a match played on Fifa or Football Manager – betting on games, in other words, that are fantasy and computer-generated. 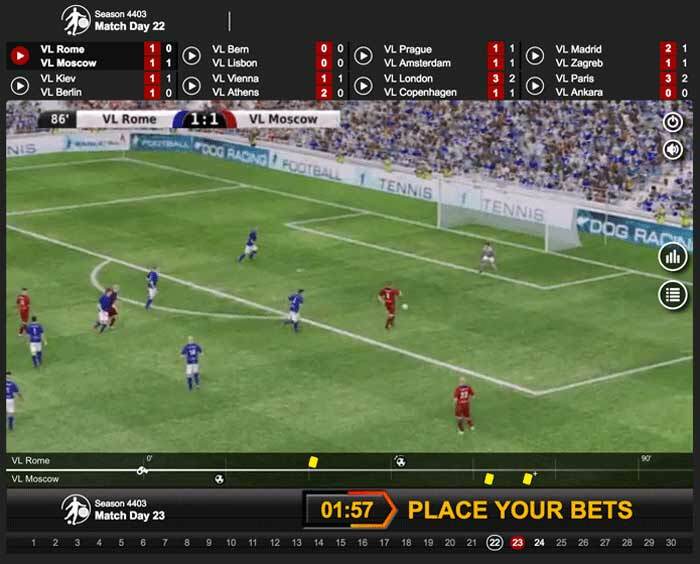 In-play video is provided that helps to make this section of the site surprisingly intriguing and addictive, while the categories of virtual sports provided include ‘Football League’, ‘Basketball League’ and ‘Horse Classics’, among others. Given how comprehensive the rest of the site is, it surprised us that there wasn’t any VIP or loyalty scheme on offer to reward especially avid bettors. Nonetheless, the wealth of other promotions that the site provides means you may not regret the absence of such a feature much. Betsafe is definitely a good site to choose if you would like to spend a large proportion of your time on a site like this playing casino and poker games. There are almost 950 video slots alone to select from, for instance, encompassing the likes of Starburst, Rainbow Riches Pick ‘n’ Mix, Monopoly Mega Movers and so many other both generic and branded titles. Or why not sample some roulette, jackpot, table or poker games? It’s all on offer at a site that really does seem to have it all as far as online gambling opportunities are concerned. The Help Centre on the Betsafe site is as comprehensive a database of frequently asked questions as we’ve seen on any sports betting site, with so many both obvious and non-obvious queries being answered in great detail. However, if you would prefer to get in touch with the site support team directly, you can do so via live chat, email or phone. It’s the former that will probably give you the quickest response, as emails may take as long as an hour to receive a reply. You can also request a call back from the team, but again, you may be left waiting an hour for this. The Betsafe website is operated by the Malta-registered BML Group Ltd, under licences issued and regulated by the Malta Gaming Authority. For the purposes of the British market, the site is subject to the highly reputable UK Gambling Commission’s licensing and regulation. Betsafe does almost all of the things that most people would want their choice of sports betting portal to do, so it should be no great surprise that we rate it highly. The lack of a VIP or loyalty scheme for sports bettors is glaring, but the site’s breadth of promotions and gambling opportunities – not just restricted to sports betting – more than compensates for this. Sign up now at Betsafe to see why the site remains one of the best places to bet on sport online.